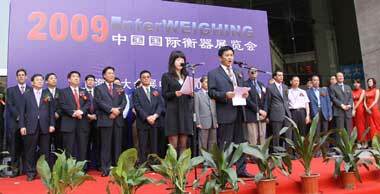 In May 7th~9th, 2009, the InterWEIGHING2009 was held successfully at Shanghai Everbright Convention & Exhibition Center. Over 280 Exhibitors from United States, Canada, Brazil, England, Germany, Italy, Spain, Turkey, New Zealand, Japan, Korea, India, Sri Lanka and Mainland China including Taiwan and Hong Kong enthusiastically participated in this exhibition. Although the global economic crisis, lots of weighing instrument enterprises were much confident with this exhibition, They actively registered to attend the exhibition, the amount of exhibitors increased 10% than 2008. The exhibition booths area was over 8500 square meters, and this was increased 23% than 2008. Custom-built booths were 70% of the total exhibition area. During the fair period, the Eighth Weighing Technology Seminar and the Council Meeting for China Weighing Instrument Association were convened at the same time. Vice presidents of China Weighing Instrument Association took part in the opening ceremony in the podium. According to incomplete statistics, the number of professional visitors amount to over 10,000 people who came from every province of China and 60 countries worldwide. 65% of the visitors were non-local Shanghai. 12% of them came from outside China or Hong Kong, Macao & Taiwan. During the exhibition, the organizer held three Weighing Technology Seminars. On these seminars, we delivered over 1,000 books of 'the Eighth National Weighing Technology Thesis'. Because the weighing technology seminars of previous exhibition have been well, many attendees registered to take part in the seminar this year. 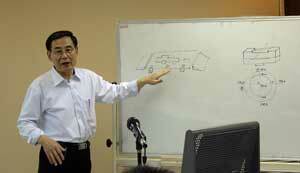 There were following features in the seminars of this year. Load cell is the key part of weighing instrument. Better performance, less weight, more simple processing technology and less raw materials are becoming the target of each manufacturer. Zhejiang South-Ocean Sensor Manufacturing Co., Ltd provide a kind of solution with “Cross beam structure sensor”. This solution has been concerned greatly on the seminar. Weighing indicator is the brain and nerve of electronic weighing instrument. Weighing indicator, as well as load cell, was become professional products which its' performance and quality was developed gradually to middle and high-end. Shanghai YAOHUA Weighing System Co., Ltd introduced an indicator using 32bit-ARM processor, which has better performance, more kinds of interface and more powerful function. Shenzhen General Measure Technology Co., Ltd launched this kind of ARM processor embedded products as well. Danaher Setra-ICG launched SuperViewTM weighing display, which had many features such as waterproof shell, programmable, 2MB internal Memory, weighing check function, etc. Network is becoming a kind of necessary technology in our life. Network technology are used in weighing industry increasing. Ningbo BOARD Electric Co., Ltd introduced their R&D software 'Network Weighing Management System', which shows every kinds of weighing management. On the Seminar, Mr. Luo Xujing introduced "Cross beam structure sensor" which R&D by Zhejiang South-Ocean Sensor Manufacturing Co., Ltd.
Strain gauge is the core part of load cell. There are still many problems should be solved in actual use, such as the deformation of strain gauge and metal elastomer should be proportional in the scope of the rated load, and should be not affected by the surrounding environment. ZEMIC introduced their R&D status of 'anti-heat and anti-wet high-precision strain gauge'. They applied 'glass fiber enhanced epoxy substrate (BHB)' and 'special substrate polyimide film (BAM)' technology in load cell and got a great amount of test data. Transcell Technology Inc introduced their 'small lag strain gauge' to manufacturers which produce stainless steel load cell. This gauge was applied with special epoxy resin materials in substrate glue and strain gauge adhesive binder, improve lag time of stainless steel load cell. This special sealing technology improved the protection performance of the load cell, solved current problem in laser soldering and Argon arc soldering. Integration is development trends in electronics industry. Integration can not only minify the volume of the products, but also improve products reliability, provide more functions and reduce products power consumption. As the rapid development in science and technology, electronic circuits is becoming more and more integration. The weighing technology is no exception. Shenzhen CHIPSEA Technologies Co., Ltd R&D high integrated CSU824+ CS1180+CS5817 module. This module was combined with fewer components, easy to maintain, has much low power consumption and higher resolution. There are 64-bit CRC check code for anti-cheating in the module, too. CSU1200 is a dedicated platform for weighing instruments. It is easily supported software and hardware online simulation. Germany Acam Messelectronic GmbH launched their enhanced single chip PS081, which integrates with 28bit AD convertor, 15uA power consumption, the measurement output frequency reached 1000Hz, 2K EEPROM embedded and 24bit CISC controller with 3k ROM. The company introduce its application in actual use, too. There were many peripheral accessories of weighing instrument showed on the exhibition before. But now, the manufactures of peripheral accessories not only showed their products on the exhibition, but also came to the weighing seminars. Shandong HUALING Electronics Co., Ltd brought us their thermal print head which is dedicated R&D for label printing scales. They introduced the new application of this thermal print head on this seminar. Shanghai BENHONG Electronics Technology Co., Ltd brought us their thermal paper which can be remained over 10 years, 20 years and 32 years, and introduced their wireless Zigbee module and it's application in weighing system. This Zigbee module can support 10m, 50m, 1000m wireless transmission application. The InterWeighing2009 focused on showing new weighing technology and products R&D by exhibitors from around the world, which include every kinds of scales, balance, weighing system, indicator, load cell, testing instrument and device, electronic component and materials used in weighing instrument. These exhibits reflected the latest technological achievements of weighing industry in today's world, meanwhile, showed current development level of weighing industry in today's China. The exhibition also had been concern of many users of weighing instruments. Many business people from metallurgy, chemicals, machinery, transportation, food, oil and other systems, who used weighing instruments a lot, came to visit the exhibition in succession. During the exhibition, the organizer specially arranged a weighing forum for the representatives from department of metrology of metallurgical Enterprise. Many trade companies and distributors came to the exhibition for trade talks with the exhibitor. In order to accelerate the pace of development, some weighing enterprises sent their staff to the exhibition to get latest information, exchange experiences and explore cooperation. Many exhibitors and customers signed supply contracts or intent contracts on the exhibition. They expressed satisfaction with the exhibition, and commend the exhibition had a real effects in enterprises promotion, technology exchanges and products launch to markets. The exhibitors felt that they benefited greatly from the exhibition, and showed intention to attend next one. They hope the organizer could promote the exhibition into a world-class level international professional exhibition. Many enterprises pay more and more attention to protection of intellectual property rights. In order to protect the invention patents, enhance patent protection, maintain the normal order in the exhibition, safeguard the legitimate rights and interests of all parties, the organizer drafted "Dispute Resolution Rules of Intellectual Property and Patent in InterWeighing2009" according to People's Republic of China's provisions of "Protection Rules of Intellectual Property Rights and Patent on Exhibition". And more, the organizer established intellectual property office for staffs from Shanghai Intellectual Property Administration to deal with complaints of alleged patent infringement in site of the exhibition. This service had been welcomed by exhibitors. From the several patents complaints processed on the exhibition, the two sides disputed could comply with the rules, and accept a settlement in site. According to schedule, exhibitors start to book their booth from September, 2008. Soon after, the global economic crisis occurred. The organizer actively responded to this situation, prepared several plans for possibility that great many exhibitors could quit. But in fact, majority of exhibitors were much confident in prospects of weighing industry. Did not show large-scale retreat of the situation, but enthusiastically registered to attend, so this show has become the largest one than every previous year's. According to statistics, there were only 6 exhibitors quitting the exhibition, 2 exhibitors reduced exhibition area. 5 of them told the organizer that they were infected by The global economic crisis. Totally, the number of exhibitors that quitted or reduced exhibition area, was less than 3% of all. The reduced area was 243 square meter, which was less than 3% of total exhibition booth area. Since 1995, China Weighing Instrument Association has organized 12 International Weighing Exhibitions in Beijing, Chengdu, Shanghai, Hangzhou, Qingdao. This strongly strengthen economic & technological exchanges and cooperation between China and international weighing industry. Made a tremendous contribution to introduce advanced technology and equipment for China weighing enterprises, to promote the production, process, technology advances, to speed up the adjustment of product structure, and to promoting the trade development. In recent years, China's annual exports of weighing products increase at a double-digit growth rate. In 2008, according to China Customs statistics, the exports of weighing products has reached USD780 million, increased 19.22% than 2007. The InterWeighing2009 was closed successfully. China Weighing Instrument Association will actively prepare for the Interweighing2010. The InterWeighing2010 has been scheduled at late April 2010 in Changsha city, Hunan province, China.